Mark Ruffalo is the worst when it comes to spoilers in the MCU, and his reputation only continues to precede him before the release of any big Marvel movie. He’s perhaps only paralleled by Tom Holland, who hasn’t gone as far as to leave his recorder rolling during a premiere yet. Brie Larson decided that she wanted to show off the Captain Marvel Empire Magazine cover early. And in doing so, she took a pretty good swing at Ruffalo and his spoilery antics. Captain Marvel has already delivered two trailers, some TV spots, a featurette, and plenty of photos. We know what the movie is, and an Empire Magazine cover featuring leading lady Brie Larson isn’t really going to spoil much at all. Though, the fact that we’re perhaps seeing it a little earlier than intended could be considered a spoiler in and of itself. Brie Larson knowns she’s not showing anything too out of school, and the whole thing was probably orchestrated by the Disney promotional team. But in any case, she used the opportunity to get a dig in at Mark Ruffalo’s expense, who, as far as we know, has nothing to do with this next MCU movie. In the MCU timeline, Bruce Banner doesn’t become the Hulk until this past decade, and Captain Marvel takes place in 1995. 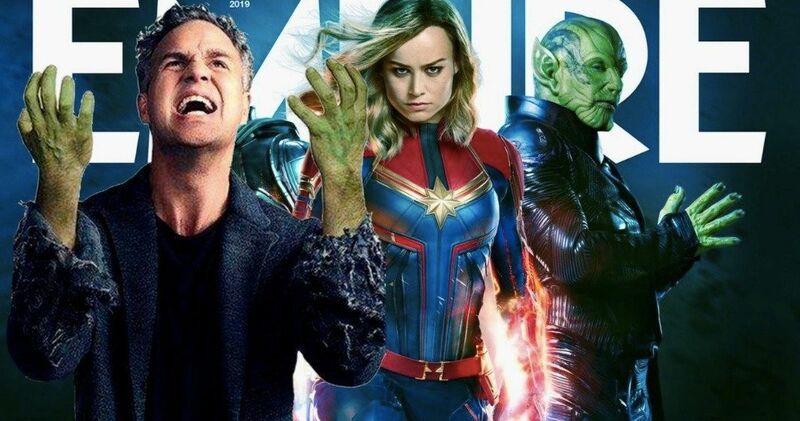 Brie Larson hasn’t quite had the opportunity to ruin things like Mark Ruffalo has. The guy drops spoilers in nearly ever interview. He revealed that most of the Avengers all die at the end of Infinity War nearly a year before the movie came out. And he notoriously left his recorder on at the Thor: Ragnarok premiere, broadcasting the first 15 minutes or so to all of his social media followers. All this spoiler talk is getting away from the real reveal at hand here. We get to see Brie Larson suited up as Carol Danvers on the cover of Empire. She is flanked by Jude Law, who is presumed to be playing Yon-Rogg but may also have a duel role as Mar-Vell. Various official Disney outlets have referred to him as both. We also get to see Ben Mendelsohn as the Skull General Talos in his true form, though we’ll also get to see him in his human mask, which, not surprisingly, looks just like Ben Mendelsohn. There will be more new photos and some cool info coming direct from the pages of Empire as shared by Brie Larson’s Twitter. This latest issue hits the stands on Thursday.